Imagine you could scan the earth with a life-detecting probe. You'd be stunned to find millions of living organisms, interacting in the most amazing ways. From leopards, lemurs and lice to ferns and flesh-eating plants, the variety of life forms that populate our planet is mind-boggling. Scientists refer to it as biodiversity. Biodiversity is more than just a lengthy list of the plants, animals, fungi and microorganisms found worldwide. It also encompasses the genes they contain, and the interactions that take place. 3.7 billion years ago, this planet was a tough place for life. Hot lava spewed from the surface of the earth and beneath the sea. Much of the land was dotted with boiling hot springs, and the atmosphere was thick with steam and carbon dioxide. So how did our planet become the hotbed for living creatures that we know today? In this unit we will see how diversity changes through succession, genetic diversity, limiting factors and human activities. This unit is a minimum of 3 hours. Evolution is a gradual change in the genetic character of populations over many generations, achieved largely through the mechanism of natural selection. Environmental change gives new challenges to species, which drives the evolution of diversity. Biological evolution is the process of change and diversification of living things over time, and it affects all aspects of their lives--morphology, physiology, behavior, and ecology. Underlying these changes are changes in the hereditary materials. Hence, in genetic terms, evolution consists of changes in the organism's hereditary makeup. During the process of evolution - the history of life on earth - both processes speciation and (mas-)extinction were very common. ​Genetic variation is an important force in evolution as it allows natural selection to increase or decrease frequency of alleles already in the population. Genetic variation can be caused by mutation (which can create entirely new alleles in a population), random mating, random fertilization, and recombination between homologous chromosomes during meiosis (which reshuffles alleles within an organism's offspring). Genetic variation is advantageous to a population because it enables some individuals to adapt to the environment while maintaining the survival of the population. 3.2.U3 Natural selection occurs through the following mechanism. Within a population of one species, there is genetic diversity, which is called variation. Due to natural variation, some individuals will be fitter than others. Fitter individuals have an advantage and will reproduce more successfully than individuals who are less fit. Natural Selection is where some species are more adapted to their environment and have an advantage in times of change. Their genes are passed onto future generation. Environment change gives new changes to the species, those that are suited survive, those that are not will not. ​Natural selection: is the where the organisms that are more adapted to the environment have an advantage over those that are less well adapted, and they survive, flourish and reproduce. Due to the process of natural selection over generations there is a movement towards fitness in the whole population, the environment constantly selecting for the individuals that are best suited to that niche. Negative changes lead to extinction. 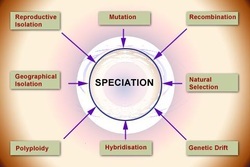 Speciation occurs as a result of the isolation (geographical or reproductive) of populations. The concept of fitness should be understood. The history of the development of the modern theory of evolution is not expected, nor is a detailed knowledge of genetics (including allele frequency). Because of the varying environment both locally as well as globally. 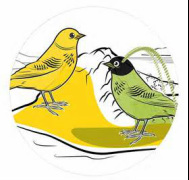 Each local environment presents different challenges at different time, if the species migrates to a new place it encounters a much rapid change. Different environmental challenges combined with the time scales involved, results in infinite number of selection criterions, thus leading to diverse selection. Which is repeated for eons. Thus the biodiversity. Humans are modifying the world in many ways, and not all of them for the better. The changes we cause are often severe challenges to animals, plants and microbes in nature, from the introduction of pathogens or exotic invasive species to adding toxic substance or excessive nutrients, or causing climatic change. A changing climate forces plants and animals to migrate in order to survive. However, research has shown that most plant species are able to migrate at only 1/10th of the speed required to keep up with human-induced climate change. To make matters worse, human settlements and infrastructure have already subdivided ecosystem habitat into isolated patches. Climate change will make many of these patches uninhabitable for the species that live there. 3.2.U6 Speciation is the formation of new species when populations of a species become isolated and evolve differently from other populations. The surface of the Earth is divided into tectonic plates, which have moved throughout geological time. This has led to the creation of both physical barriers and land bridges with evolutionary consequences. Isolation of populations, behavioral differences that preclude reproduction and the inability to produce fertile offspring (leading to speciation) should all be examined, with examples. 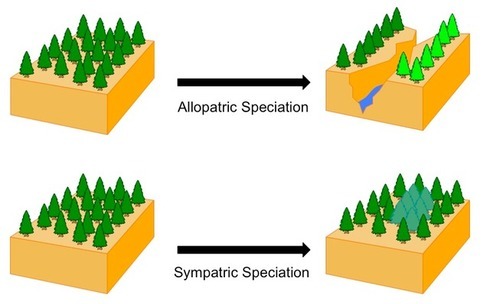 Allopatric speciation occurs when a species separates into two separate groups which are isolated from one another. A physical barrier, such as a mountain range or a waterway, makes it impossible for them to breed with one another. 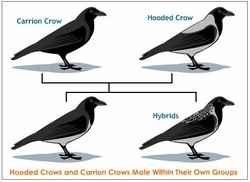 Each species develops differently based on the demands of their unique habitat or the genetic characteristics of the group that are passed on to offspring. Sympatric speciation occurs when there are no physical barriers preventing any members of a species from mating with another, and all members are in close proximity to one another. A new species, perhaps based on a different food source or characteristic, seems to develop spontaneously. The theory is that some individuals become dependent on certain aspects of an environment—such as shelter or food sources—while others do not. Some scientist don't believe it exist. Parapatric speciation occurs when a species is spread out over a large geographic area. Although it is possible for any member of the species to mate with another member, individuals only mate with those in their own geographic region. Like allopatric and peripatric speciation, different habitats influence the development of different species in parapatric speciation. Instead of being separated by a physical barrier, the species are separated by differences in the same environment. The cichlid fish in the lakes of East Africa are one of the largest families of vertebrates. In Lake Victoria there are 170 species of cichlids; in Lake Tanganyika 126 species; and in Lake Malawi 200 species. These populations have probably been isolated for millions of years and have been exposed to different selection pressures because of there slightly different environments. Therefore the fish have adapted to their specific environments. As long as the population is large enough, isolated populations can thrive, if the populations become too small they will die out. Large flightless birds: e.g. the emu, ostrich, cassowary and rhea. They only occur on those continents that were once part of Gondwana land (Africa, Australia/New Zealand, and South America). However, because Gondwana land split up a very long time ago the species are not closely related. The consequences of plate tectonics on speciation should be understood (that is, the separation of gene pools, formation of physical barriers and land bridges) together with the implications these consequences have for evolution. The role of plate activity in generating new and diverse habitats, thus promoting biodiversity, should also be considered. Detailed understanding of the mechanism of plate tectonics is not required. The earths crust is split into sections called tectonic plates. Convection currents in the mantle (the molten layer under the crust) drag these plates slowly in different directions. In some places the edges of the plates crash into each other (destructive and collision boundaries) and in other places the plates edges move apart (constructive boundaries). Mountain ranges form a physical barrier that many species do not cross, this allows isolation of gene pools and subsequently uniques species of plants and animals living on the same land masses. Plate seperation such as the African and South American plates moving apart also allow isolation of gene pools. The movement of land masses has also meant that many continents have travelled through different climate zones (over millions of years) which has led to species adaptation and evolution. Plate Tectonics therefore lead to the development of physical barriers, and land bridges (e.g. between North and South America, which allows movement of organisms, e.g. Bears from North to South America.) Land bridges may be formed by continental drift or lowered sea levels (e.g. between North America and Asia, the Bering Straits). Another example of how plate tectonics has affected the evolution of species is the Llamas and camels, which are both domesticated animals fulfilling similar roles and they are distant cousins. Kangaroos fulfil and similar ecological role to cattle in Australia. Both are large herbivores (eat grass and convert it into meat). Kangaroos are marsupial mammals. All mammals suckle their young with milk produced by their mothers. Placental mammals have a placenta, which provides food for the embryo in the uterus and are the most successful in evolutionary terms. Marsupials have a pouch in which the embryo develops. 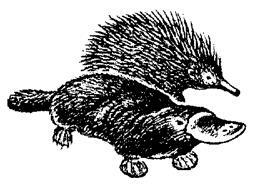 The monotremes lay eggs (duck-billed platypus) are the third group of mammals. Marsupials and monotremes are mostly confined to Australasia and placental mammals have out-competed them in all other regions. ​A mass extinction is defined as a period in which at least 75 % of the total number of species on the Earth at the time are wiped out.. There have been five major mass extinction events in Earth's history. These are shown in the table given, along with the major events that characterized each. We are currently living through the 'sixth' mass extinction according to many scientists. The present rate of extinction of species is thought to be 140 000 species per year since approximately 10 000 BC and has continued into the 21st century. The extinction includes disappearance of large mammals such as the woolly mammoth. The sixth extinction event is thought to be occurring at a rapidly increasing rate. The two major causes for the sixth extinction are thought to be human hunting and the rapid rise in human population. ​3.2.A1 Explain how plate activity has influenced evolution and biodiversity. The movement of the major and minor plates in relation to one another is called plate tectonics. Land bridges can form from previously unconnected plates allowing species to spread. The movement of plates through different climatic zones allows new habitats to present themselves, and allow for different adaptations. 3.2.A2 ​Discuss the causes of mass extinctions. explain all the losses of species at a particular mass extinction event (not just specific losses e.g. dinosaurs). explain why some organisms died and others survived. be based on natural events and processes that are shown to have occurred around the time of extinction. Between 1.4 and 1.8 million species have been described and named. The number of species alive on Earth is ever changing. Some become extinct, while others evolve into new species. Extinction is a natural process, eventually all species become extinct. The average lifespan for a species varies. The rates at which extinctions occur are not constant and depend on the background extinction rate as well as mass extinctions (when a sudden loss of species occurs in a relatively short period of time). Background extinction rate: is the natural extinction rate of all species. 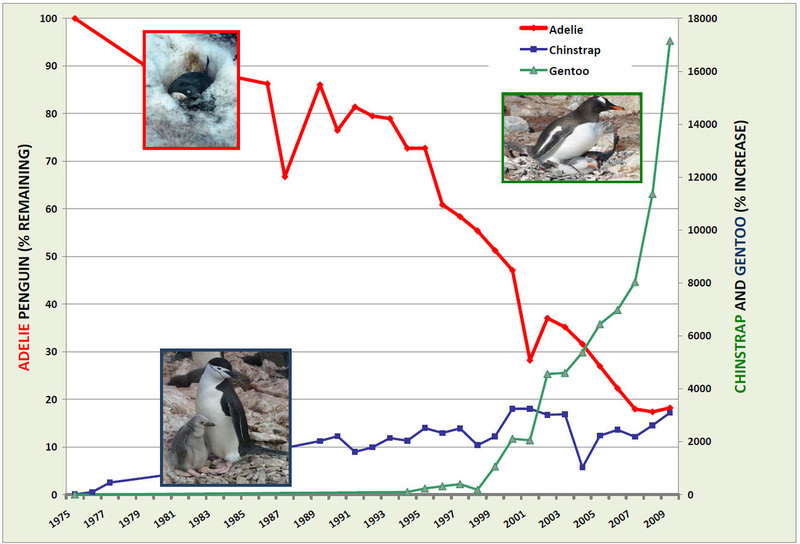 Rates are estimated by using fossil records. There are about 5000 mammal species alive today and there background extinction rate is estimated at 1 per 200 years but the past 400 years has seen 89 mammalian extinctions. Another 169 mammalian species are listed as critically endangered. E.O. Wilson, a well-known biologist, thinks that the current rate of extinction is 1000 times the background rate and that is caused by human activities. The rate is estimated to be at 3 species per hour. The rate is not equally spread but is worse in certain areas (hotspots). 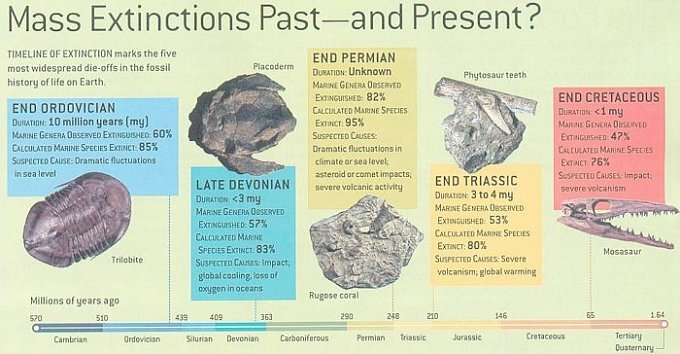 Mass extinctions have occurred over geological time and there have been five major ones. We know this from fossil records. These could have been caused by a natural disaster such as a volcanic eruption, which results in many species dying out as they can not adapt to the changed environment. Most biologists think we are now in the sixth mass extinction, called the Holocene extinction event. This extinction event started 10 000 years ago when large mammals such as the woolly mammoth and sabre-tooth tiger became extinct. But the extinction rate has accelerated in the last 100 years. This is mostly due to climate change, which is caused by one species, humans. Transform the environment: with roads, cities, and agriculture. Overexploit other species: fishing, hunting, harvesting. Introduce alien species: which may not have natural predators and therefore make the environment unstable. Pollute the environment: which may kill species directly or indirectly. The theory of evolution by natural selection tells us that change in populations is achieved through the process of natural selection-is there a difference between a convincing theory and a correct one? Within the human population, distinct characteristics have evolved within different populations through natural selection and exposure to the environmental conditions that were unique to the regions of those populations. How has globalization altered some of the environmental factors that were formerly unique to different human populations? Human impact has increased the rate at which some mass extinctions have occurred on a global scale. Hank explains specification - the evolutionary process by which new biological species arise - in terms of finches, ligers, mules, and dogs. According to the United Nations, we are losing about 200 species per day--a thousand times the normal background rate of extinction. How does this stack up to previous mass extinctions? ​Hank takes us on a trip through time to revisit the 5 major mass extinction events that have impacted species over the Earth's history, and leaves us with some thoughts about what could possibly be the sixth event - the one caused by human activities. ​"Medea Hypothesis" author Peter Ward argues that most of Earth's mass extinctions were caused by lowly bacteria. The culprit, a poison called hydrogen sulfide, may have an interesting application in medicine.